Once the snow starts falling, the cars start sliding. Nevertheless, there are some winter preparation tips to follow to help you stay in control. Once the snow starts falling, the cars start sliding. Winter can be one of the most dangerous times of the year to be on the road because of the particularly harsh driving conditions. Snow and ice prevent your wheels from getting traction, which can cause unexpected slippage, loss of power, and low visibility. Nevertheless, there are some winter preparation tips to follow to help you stay in control. According to US News, one of the top tips for preparation is the put an emergency roadside kit in your car. You should always have a flashlight, road flares, a first-aid kit, blankets, a bag of kitty litter (for traction), and emergency rations in case you get stranded. Next, be sure you’ve topped off the coolant/antifreeze in your car. It’s important that you have a 50-50 ratio of antifreeze and water in your cooling system to prevent any cracking in the engine block. Check your tire tread and pressure as well. Try the penny test—flip a penny upside down and put it in the middle of the tread. If you see above Abe’s head, you need new tires. In terms of pressure, check the manual. Tires lose 1 psi per every 10-degree dip in temperature. You should also switch to a winter-grade oil. It’s best to switch to a lower viscosity oil, which makes it thinner (which is better for cold weather to help it move more freely). So, for instance, while you might normally use 10W-30 oil, ask your mechanic to switch to 5W-30 oil. Another way to be prepared for the winter is to get your car inspected. 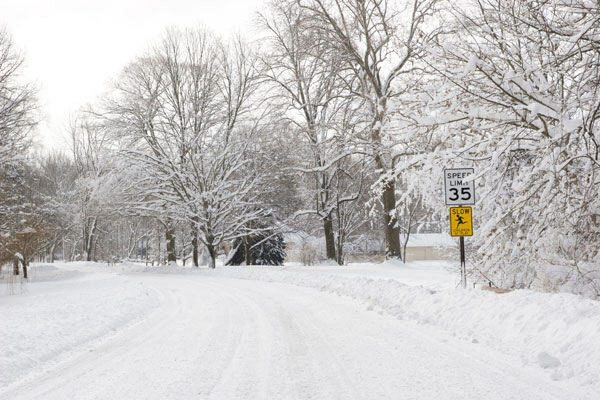 Schedule an appointment with Rothrock Motors and we’ll make sure your car is equipped to handle snow and ice alike.